Ampersand is pleased to present Coliseum, an exhibition of drawings and prints by Portland artist Avantika Bawa. The singular focus of her work here is the Veterans Memorial Coliseum, an iconic Portland building completed in 1960 that was designed by the architectural firm of Skidmore, Owings and Merrill. The original home of the Portland Trail Blazers, this 12,000-seat venue was the site of three NBA finals, including the Blazer’s 1977 championship. As an avid Blazer’s fan (the exhibition intentionally coincides with the start of the 2018 NBA season), Bawa’s deep connection to the architecture of this space is partly rooted in the sports legacy of the city. As such, it reminds us that to be a fan of sport is not just about the outcome of games; there is also a distinct nostalgia for the buildings in which games are played. Even so, Bawa’s works on paper say nothing specific about the actual game of basketball, nor do they seem wholly intended to reveal more about the architecture of the Coliseum. Instead, through a process of abstraction and repetition, a committed focus to a single form, the works can also be viewed as a statement about the practice of drawing itself. 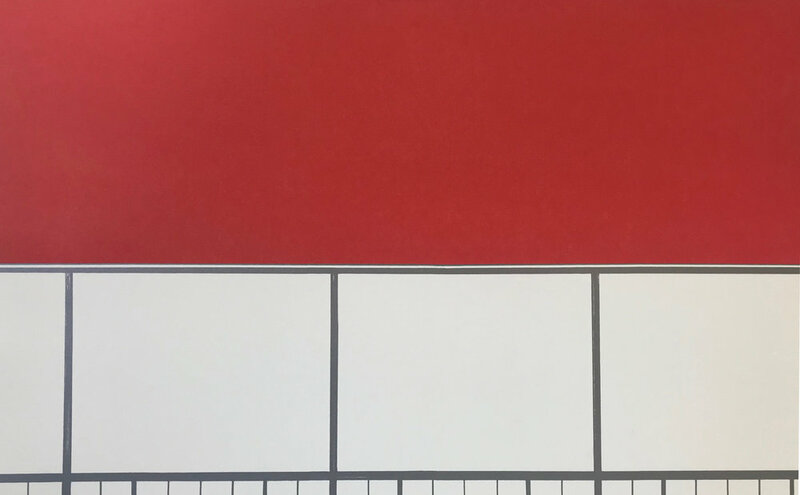 Once accustomed to the general shape of the building, our focus shifts to Bawa’s dynamic and nuanced use of graphite and pastel, degrees of grays and blacks occasionally offset by a brilliant red or murky blue. Bawa emphasizes that geographic and architectural differences in landscape strongly inform her work. It is worth noting, then, that drawings made while a spring resident at Nes Artist Residency in Skagaströnd, Iceland and prints made this summer at Crow’s Shadow Institute of the Arts differ greatly in tonal range; light and ethereal on one hand, dense and bold on the other. This notion extends to the site specificity to Bawa’s exhibitions themselves. Running concurrent with APEX: Coliseum at the Portland Art Museum (PAM), which was curated by Grace Kook-Anderson, Bawa sees distinct differences in works exhibited at Ampersand versus those on view at PAM. “The work at the museum reflects a more meditative and formal response,” she says, “while the drawings and prints at Ampersand reveal a sense of constant inquiry through experimentation.” This contrast is evident in the range of compositions, sizes and colors that are consciously paired down in the selection of works at PAM. The choices at Ampersand, Bawa notes, are more diverse, including views of the interior, the bowl (a salient feature of the building), as well as two works that reflect the construction of the building. Finally, three large drawings at Amperand have been intentionally unframed inviting viewers to engage more closely not just with the Coliseum’s form, but with the materiality of the drawings themselves. Avantika Bawa lives and works in Portland, Oregon. Originally from New Delhi, India, she received an MFA in painting from the School of the Art Institute of Chicago in 1998. Bawa’s practice emphasizes the intersections where drawing and sculpture, stasis and motion and the functional and non-functional intermingle. Her work has been widely exhibited, including APEX: Coliseum currently at the Portland Art Museum (through February 10, 2019), curated by Grace Kook-Anderson. She is the recipient of several awards, notably the Oregon Arts Commission Joan Shipley Award, the Crow’s Shadow Institute of the Arts 2018 Golden Spot Residency Award and, most recently, the Hallie Ford Fellowship in the Visual Arts presented by the Ford Family Foundation. Her exhibition at Ampersand is supported in part by the Regional Arts & Cultural Council.